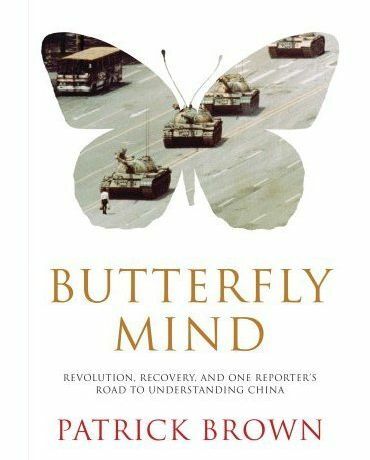 Patrick Brown may have a “butterfly mind”, as one of his teachers described him, but whether in a book like this, or in an international radio or television broadcast, he certainly writes a mean story. Born in Birmingham, England, and educated at Downing College, Cambridge, he started reporting in Montreal in the l970’s during the Quiet Revolution. His success took him to many of the major political events of the past quarter century, including the Solidarity Movement in Gdansk, Poland; Cambodia where Brown covered the aftermath of the Khmer Rouge genocide; the fall of the Berlin Wall; the revolution in Czechoslovakia, and the war in Afghanistan. Brown first visited China in l989 during the Tiananmen Square protests. He has returned many times, and in fact now lives in China. A distinct thread in Brown’s memoir is his addiction to, and recovery from alcohol. He is open and candid about the part it played in his journalistic career and just as candid about the devastation he experienced before he got help and gave it up. He devotes the whole last third of the book to China and acknowledges that the country’s size and complexity make it impossible to predict which way it is going to turn. Which doesn’t stop his mind from flitting from one vivid picture to another. His book is particularly timely, designed as it is to come out on the eve of the recent Beijing games. He shares some fascinating thoughts.